I have been thinking about this for a while so feels great to see it come together! I absolutely love working with professional models but have thought that as the EDITION woman is probably more like your mum, grandma, aunty or sister it would make more sense to show them in my clothing. When I had the girls I thought what a great opportunity to test out this idea with my own mum and sister. Thanks for agreeing to model and always inspiring me, Marney and Mum. Through this collection I have explored the relationship between a women and her body and how this can be altered by a garment. I love to explore the female form through different stages of life. Being pregnant and now feeding small babies, has affected the clothing I wear and design. The ever evolving nature of this change has inspired me to draw parallels between my design practice and this process. At the start of 2017 I travelled to Seoul, South Korea as part of the Australia Korea Emerging Designer Exchange Program. When applying for this program I was forced to think about EDITION's point of difference and purpose. 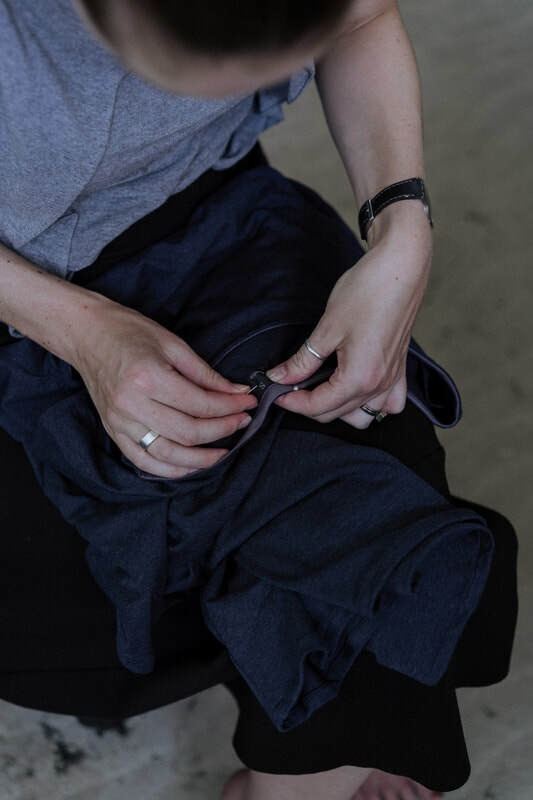 This collection was really exciting for me as I decided to go right back to the start of my design process and look at the importance of zero waste fashion and how my Selvedge to Selvedge pattern making had developed. While travelling as part of the program I was inspired to create a new collection from what I saw, I purchase fabrics in Seoul from the markets that I used in the two printed fabrics in the collection including the V top and Print Tie dress. I also meet a lovely lady named Meriel from Full Circle Fibres while in Brisbane and used her beautiful Aussie Super Cotton in the collection including the Raw jacket, Tie dress, Long jacket and Cape dress. Seeing the huge volume of garments in Seoul confirmed to me that creating small collections and custom orders is a way that I can put what I create in the world and it will be loved and appreciated for a long time. At the end of the program I invited two of the Korean designers to come to Canberra and stay with me for the weekend. Eeunhee and Kate kept saying that the colours of Canberra and the beautiful flow and calmness was reflected in my garments. I have always thought this myself and was wonderful to hear it from designers from the other side of the world. This collection was a continuation from the collection I created for my own wedding. I wanted to explore creating garments that were more 'formal' than my previous collections but still using the fabrics that I love such as 100% Merino wool sourced from New Zealand, sheer cotton and viscose. The exploration of materials and the female body influenced the shapes of the garments. I wanted to create pieces that were comfortable and functional while experimenting with sleeves and lower necklines to reveal and then conceal parts of the body. This collection, not surprisingly, was inspired by my relationship with my now husband and the way we came together to become a family . The process of creating the dresses begun by looking at the environment where we were getting married, the beautiful tones of the landscape near our house where the photos are taken and my connection to each person. I used belts and ties in some of the pieces to show the tying together of the two of us. The shapes of the dresses were influenced by their wearers and I spent one on one time with each woman to understand their body shape and making sure they felt as comfortable as possible in the pieces. In the collection my wedding dress is wool and the other dresses are viscose all having beautiful movement and allowing maximum comfort for effortless beauty. The Mirror Mirror collection explores the act and art of dressing in the morning. A mirror is always part of the process of getting dressed and I played on the idea of it distorting what you see and in return how garments can be distorted to make the experience something different to what you normally do. The body and the garments became elongated and exaggerated with striking silhouettes being formed. Each piece is designed to be explored by the wearer with a combination of viscose, wool and cotton being used throughout the collection. en-twine: to twine with, about, around, or together. The Entwine collection explores the relationship between a women and her body and how this can be altered by a garment. A garment is not created without considering the way it will entwine with the wearer. Through this concise collection seam finishes have been refined so that garments are just as beautiful inside and out. 100% linen is the fabric used in the orange and cream garments, with the remainder of the collection made from quality viscose. The In Motion collection was inspired by the pace in which life moves. Often it feels as through everything is going so slowly, yet there are not enough hours in the day. Everything keeps moving and changing and this idea of motion was translated into a circular shape that was used in the construction of each garment in the collection. Each garment was only realised once it was tried and tested many times. The collection explores the potential of zero waste pattern making through the way shapes fit together and the way the pieces drape. The entire collection is made using sustainable, Selvedge 2 Selvedge zero waste pattern making. 100% Merino wool is the fabric used in the orange and cream garments, with the remainder of the collection made from quality viscose to allow for raw edges on garments. 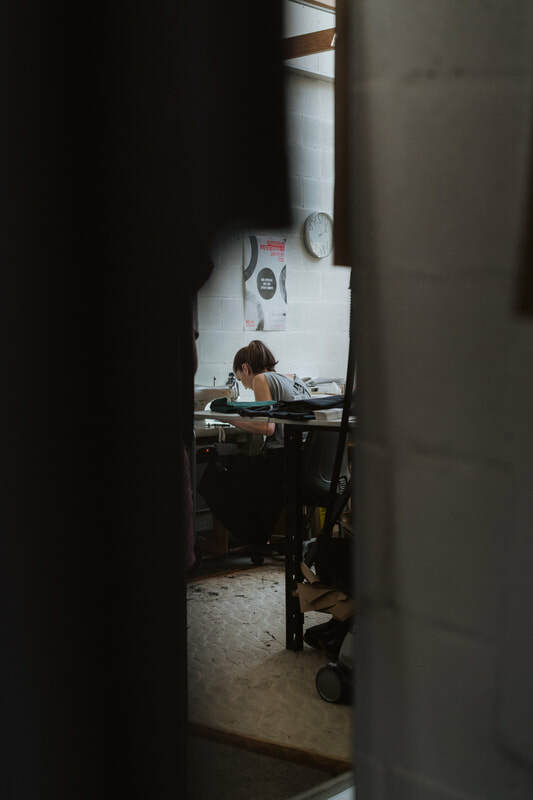 Place is an integral part of the EDITION design process, a strong connection to Canberra has been formed as it is where the garments are made and inspiration is found. The Until we Arrive collection is inspired by the journey of the Bogong moths each year as they travel to and from Canberra. In particular the landscapes they inhabit, such as the Australian Alps and rock forms around the Canberra region. The transformation of the moth's physical form during its lifecycle has inspired the stories in the collection. Garments were only realised once they were tried and tested many times. The collection explores the potential of zero waste pattern making through the way the shapes fit together and the way the pieces drape. This collection explores the process of working with cloth as the crucial element in the realisation of a garments aesthetic. Uncovering the importance of sustainable garments and practices for design. The EDITION pieces were realised once they were tried and tested many times, playing with hidden pockets and multifunctional aspects. By taking the cloth that inspired me through the way the shapes fit together and the way they drape, the collection explores the potential of zero waste pattern making. This collection follows on from the EDITION graduating collection. The pieces are inspired by the Oddie Refractor observatory at Mount Stromlo in Canberra. By taking a place that inspires me through the history, textures, colours and ideas embedded into it, the collection is an addition to its history. The EDITION design process begins with searching for a place to interpret into a wearable collection. I am drawn to places where there are traces of the past, which are organic, raw and have a rich history ingrained in them. While researching the history I take many photos of the place to truly capture the essence of it. These photos provide inspiration for the pattern making for EDITION garments, with design lines being drawn from the shapes in my photographs. The unique Selvedge 2 Selvedge pattern making system that works with the zero waste philosophy allows for a more sustainable approach to fashion design in the EDITION label. 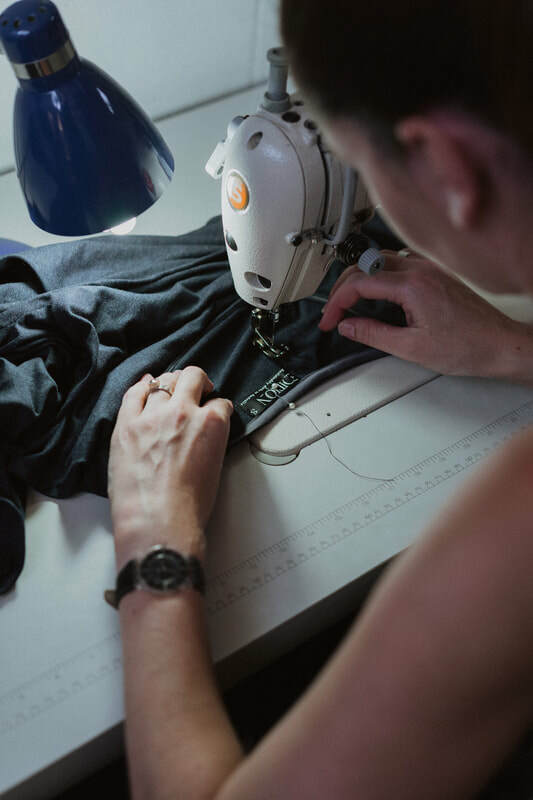 This practice allows for a piece of cloth to have integrity throughout the whole process, before it is a garment, while it is being made and once it is in the consumer’s hands. The Observer collection was inspired by the Oddie Refractor observatory at Mount Stromlo in Canberra, where the photoshoot took place. By taking a place that inspires me through the history, textures, colours and ideas embedded into it, I am able to add another layer to the place. It is a means for capturing the time and adding a piece to the history. The EDITION design process begins with searching for a place to interpret into a wearable collection. I am drawn to places where there are traces of the past, that are organic, raw and have a rich history ingrain in them. While researching the history I take many photos of the place to truely capture the essence of it. These photos provide inspirtaiton for the pattern making for EDITION garments, with design lines being drawn from the shapes in my photographs. The unique Selvedge 2 Selvedge pattern making system that works with the zero waste philosphy allows for a more sustainable approach to fashion design. The Selvedge 2 Selvedge pattern making has been delveloped with designer Amy Taylor for AYLOR.